Singapore firms inked agreements on Wednesday (May 11) for 16 projects spanning hi-tech manufacturing and modern services in Liaoning, China. Almost half of the projects will be undertaken by small and medium enterprises (SMEs), said trade agency International Enterprise Singapore. 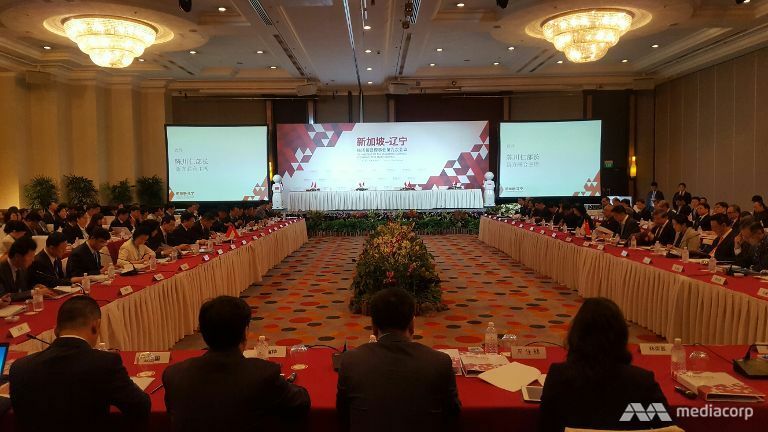 The agreements were signed at the 9th Singapore-Liaoning Economic and Trade Council meeting in Singapore on Wednesday which was co-chaired by Minister for Social and Family Development Tan Chuan-Jin and Liaoning Governor Chen Qiufa. The deals ride on China's plans for revitalisation of its Northeast provinces - namely Liaoning, Jilin, Heilongjiang - IE Singapore noted. Liaoning is focusing on developing strategic hi-tech industries and modernising its manufacturing sector, as well as further liberalising its services sector, with priority on raising the quality of education and healthcare services. Singapore companies can contribute their expertise in these areas, as seen by the projects signed at the meeting, said IE Singapore. One project involves Fujicon Engineering working with Shenyang's Siasun Robot and Automation to develop a series of automated storage solutions for the food industry. In another, Etonhouse Group will set up the group's first international school in Northern China. It will offer international educational programmes in the early childhood, primary and secondary levels (K-12) and language training. Q&M Dental Holdings (China) Pte Ltd signed an agreement to build a modern international standard dental hospital in Xinglongtai District. It will also tie-up with a Chinese firm distribute dental equipment and material supplies. SMEs, especially healthcare and education players, have further ventured into less-developed regions in the province, said IE Singapore, with more than a third of the project deals signed on Wednesday involving inland cities like Fushun, Panjin and Yingkou. Said Minister Tan: "The less competitive environment in Liaoning makes it an ideal location for SMEs to build their presence. Coupled with the rise of consumerism in Liaoning and the government's focus on improving the standards of living for its people, there are opportunities to cater to the new needs and demands. These include the education, healthcare and lifestyle-related sectors." Singapore is Liaoning's fifth largest investor and trading partner. In 2015, bilateral trade between Singapore and Liaoning increased by 4.2 per cent to US$3.98 billion. As of May 2016, Singapore's cumulative actual investments into Liaoning hit US$5.73 billion with a total of 956 projects.